Today, the first thing I read when I turned on my laptop was a story about a fake drug dealer who wears a white tuxedo and dolphin headpiece, and leaves fake crack in paper bags on doorsteps to his fake drug clientele. This fake drug dealer, Nate Hill, is a performance artist. People love it. People hate it. Personally, I feel it is at the same time a bit genius, and the most pretentious and ridiculous thing I've ever heard of in my life. I think it's both, and I think that's the point. It's a story about a story about a story about a story. Postmodernist to the extreme. Specifically, you are now reading my version of this event, which I read as a news story, which is about an artist's own story, a take on drug dealing, which he has likely, like most of us, has seen portrayed and fictionalized ad nauseum on the news, in novels, television shows, and films. If the medium is the message, and the medium is far enough removed, apparently at some point it must turn into a dolphin in a white tuxedo. Is it random? I think randomness is the biggest point of it, meant to take the meaning out. But, in keeping with an idea that the current state of postmodernist culture is now so extreme, and perhaps has pinnacled and bottomed out, and that it, like a yin yang symbol, turns back onto itself, morphing into its opposite—high meaning and direct experience--what can we make of this dolphin a white tux delivering crack? Dolphins have long been associated with the esoteric. There are recent notions involving the evolvement of dolphins. One is that their language—what we term and understand as whistles and clicks-- may be holographic in nature, literally invoking a visual and tangible reality full of who-knows-what. 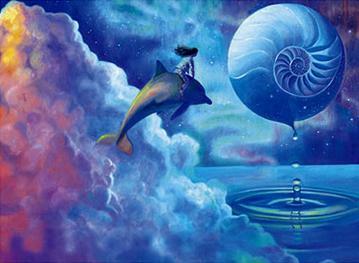 What we view and perceive, because of our own human senses, as dolphins in the water, may be only a bare-bones-shadow of what's really going on—perhaps akin to the liquid-filled plugged-in pod dynamic in The Matrix. Another is that gray aliens are actually far evolved dolphins, or share a common ancestor with dolphins—that grays are to dolphins what humans are to apes. I'm not asserting this is truth, believe me. However, these are narratives and ideas out there. Recall the Simpsons episode in which mad, talking dolphins take over. I even recently read about a movement which includes dolphins present at human childbirth, as I recall, dolphins were actually referred to as midwives. The children resulting from such birthing experiences are supposedly super duper spiritual and psychic. Clearly, dolphins have been cast in both a lofty spiritual space and appointed with an anthropomorphic identity of personhood. Dolphins are the more ancient, more spiritual, better person—a new Other. The choice of donning a dolphin headpiece to deliver fake crack could not be more inappropriate. Combined with the white tux, it could not be more absurd. The white tux at once brings to mind religious clothing and the highest sense of secular formality. In this white-suited dolphin, there may actually be an Aquarian age Savior archetype of sorts, albeit perverted, bringing the people their desired sacrament, albeit unholy. I've no idea if the artist intended such, but the symbology is there. I'm reading a lot into it. However, I came to these ideas only after being quite mystified over the reactions of the people to the "performance." It seems absolutely harmless. It is apparently done with no pretense of being a "real" drug experience. It's silly. So, why the overreaction? Why is this even news? Although they have their social critics, television shows like The Wire and films like Traffic are respected and highly praised by a wide range of social camps for their realistic or artistic portrayals of drug culture. What is the difference? Is it because one is serious, and another seems mocking? I'm not sure about that. Very often, drug dealers are fictionally depicted as stupid, morally void, obese, ugly, and more often than not, they meet an end of poetic justice. Is that not a form of mockery? There is certainly no allegiance to drug dealers required in popular culture. Could it be the television or movie screen itself serves a purpose necessary to enjoyment or appreciation of difficult or uncomfortable artistic topics? When it comes down to it, there's really no difference. In this case, the medium may prove to be a gigantic part of the message received. In each case—the films and the dolphin performance art--the participants are simply staging a performance, complete with drugs, drug dealers, and drug users. Still, one is acceptable, and one is not. I feel there's something more subtextual going on. Because of the loaded symbology of the dolphin, and general visual archetypal image the performance artist has patched together (consciously or not)--mixed with another modern archetype—the Drug Dealer—it is seen as an abomination. Like the Madonna/Whore dichotomy, the Savior/Drug Dealer is incompatible, irreconcilable. It just rubs people the wrong way.